While Zephyr isn’t quite as cool as Ocarina [iTunes] — there’s no blowing into iPhone’s microphone to create music this time — it adds another element: Messages. You see, you create music on Zephyr by touching the screen. While you could just draw gibberish, the point is to send a holiday message (the writing is in snow flakes) to someone elsewhere in the world. For example, in testing out the app, I’ve already gotten the messages “Peace” and “Happy Holidays,” accompanied by the music produced from writing those statements (see video below). via Ocarina maker Smule back with a holiday iPhone app, Zephyr » VentureBeat. I recently discovered a new iPhone app, Gratitude Journal, and it’s quickly become my favorite way to journal. I’ve long kept a journal and found it to be a beneficial activity. Carrying an iPhone, it seemed natural to keep a journal on my phone so I could add entries no matter where I was. Unfortunately, I hadn’t found any iPhone apps that I felt compelled to routinely use for journaling or that password-protected my entries in case my phone was lost or stolen. I love the beautiful simplicity of Gratitude Journal’s user interface design. As you journal, you add bullet points – no pressure to add long entries, just add a quick thought of gratitude, press return and add another (lather, rinse, repeat). 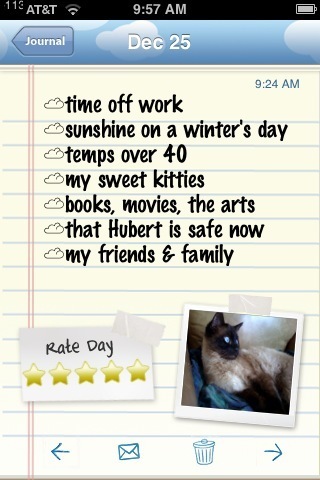 You can rate your day from 1 to 5 stars, and also add a photo from your iPhone’s Camera Roll (if you’d like). If desired, you can add a 4-digit password to protect your entries. Because the Gratitude Journal focuses you on the good things in your life, it feels great to journal using this app. And it quickly becomes a wonderful habit. Carla Kay White (the app creator) blogged about why she wanted to create this app and how she’ll be donating a portion of the proceeds to charity: The Making of an iPhone App – Gratitude! 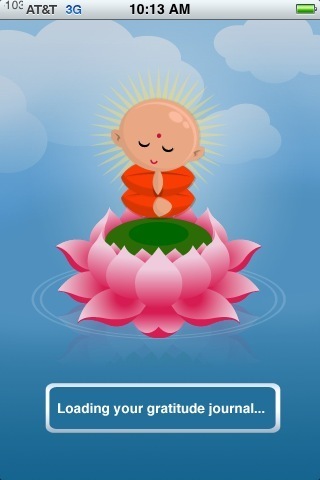 Gratitude Journal costs 99 cents at the iTunes App Store. How it’ll make you feel using it every day? Priceless.